Home » healthcare » parenting » Children lack sleep, is it true that there are signs of health problems? Children lack sleep, is it true that there are signs of health problems? There are a number of things that cause a child to sleep badly so he wakes up faster than usual. The following will review the causes, what is the ideal duration of sleep for the child, and how to make him sleep well. Children sleep less because they don't want to take a nap or often wake up at night but have trouble falling asleep again? Most parents worry about this situation. Do not let children lack sleep or even suffer from an illness. Maybe you have let your child sleep longer so that tomorrow he can wake up to the time you expect. Unfortunately, this method is not right, Parents. Making children sleep late, actually makes his body tired. As a result, children find it difficult to sleep, sleep badly so they will wake up more often, and can make their health disturbed. There are studies that prove children accustomed to sleeping late will adversely affect their motoric, language and social abilities. Your role as a parent, help children to make biological sleep hours. Avoid following the child's desire to be awake. 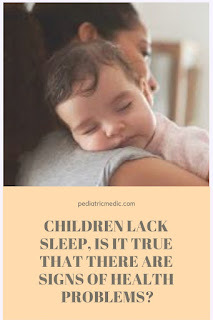 It is not true if a child who lacks or doesn't even take a nap will make him sleep well at night, and wake up refreshed in time for the morning. Lacking or not napping actually makes children have trouble sleeping at night. There are studies revealing, children who do not take a nap lose expression such as happy, smiling, and laughing as much as 34%, when asked to complete the puzzle game. And they will show an increase in negative emotions by 31% when dealing with puzzles that are more difficult and difficult to solve. Observe the child when the afternoon nap comes. When children start yawning, the attention span begins to decline, this is a sign that children need to take a nap. His body was tired and needed rest. For children, sleep activity is a learning activity. Learn to sleep according to a predetermined time. Likewise with the ritual activities before going to bed, such as urinating, brushing teeth, washing hands and feet, changing clothes, and praying. If he sleeps at 8pm, give him time for activities before going to bed. For example, children need 15-20 minutes for all of them. Remind children 15-20 minutes before bedtime. When a child postpones performing the ritual before going to bed, he automatically postpones sleep. As a result, the child will be awake, and only sleep when the body condition is very sleepy. The result, he can fuss when he wants to sleep. His sleep was not sound because his body was too tired. Not dismissing the possibility, there are health problems in children that make it difficult to sleep and quickly wake up from sleep. Observe the child's body, yes, Parents. Use dim lighting during sleep. So that the child is aware that when the lamp is used, it means he must sleep. And when there is a bright light, a sign that he must wake up. Create a comfortable environment. Starting from bed linen, blankets, clothes, room temperature, and calm or not noisy atmosphere. Keep the TV and gadget away from children who want and are sleeping. Apply that bed only to sleep, not to play. So when you take him to bed, he knows that he has to sleep. Make sure the child's stomach is not empty or full. Both of them make him unable to sleep or sleep badly. Give warm drinks before the child sleeps. Warm chocolate milk is believed to provide comfort to someone. Suitable for drinking before bed. Consistent with the application of a child's biological clock. The little one can get used to it. Parents, whatever you do to make a child sleep fast and sleep well, do it with love. No need to force your child to let out your anger. This kind of coercion actually makes children anxious, so it becomes more difficult to sleep. Do this sleep learning process lovingly and consistently.